Prototype: German Railroad, Inc. (DB AG) type Kls 443 low side car. "Serval" all-terrain vehicle specially equipped for Special Commando Forces (KSK). Readied for foreign use. Model: The railroad car has side walls modeled from the pressed metal prototype. Length over the buffers 15.7 cm / 6-3/16". 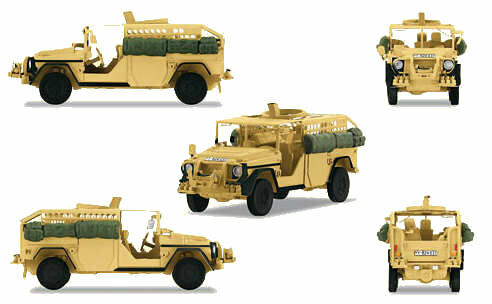 The 2 models of the military vehicle are constructed of metal and have other components made of detailed plastic parts. Length for each model approximately 6.5 cm / 2-9/16". Military vehicles are new tooling. Military vehicles constructed of metal.